Naja is the perfect killer – because she feels nothing. Literally. Her body registers no pain, nor does her heart, coldly executing jobs given to her by her mysterious boss, known only as “Zero.” When another killer in Zero’s organization targets Naja for elimination, she has no choice but to fall off the grid and seek answers, as bloody as they might be. I have mixed feelings about this graphic novel. It started off strong but slowly spiraled into…negativity. At first I liked Naja but as it went on she became more irritating (or the way she was portrayed did), the sly comments about different cultures really irritated me and she came across as really lifeless. She seemed really one-dimensional rather than an actual complex character. I loved the drawing style but sometimes it often seemed over sexualized (especially the violence) but the actual style was really interesting. The ending just read like a bad episode of Hollyoaks. There isn’t really much I can say about it as it was just really strange and slightly disturbing (especially the consent issues). 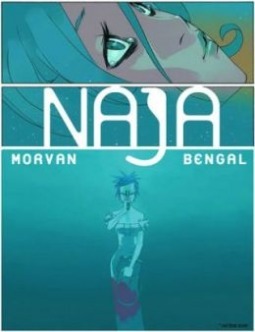 I felt like the author was trying to portray Naja as a ‘strong female character’ *eye roll* but instead just objectified and sexualized her as a lot of male writers tend to do when writing female characters. I’d definitely research the triggers it contains if that is something that could affect you. This makes me seem really negative but it was just a really bizarre story. Interesting review. Yeah, the artwork is one of the first things that stands out to me on the cover, but I can see what you’re saying, although I haven’t read it yet.